Randomly shuffle the Faction Mats and Player Mats, then deal 1 of each to each player. 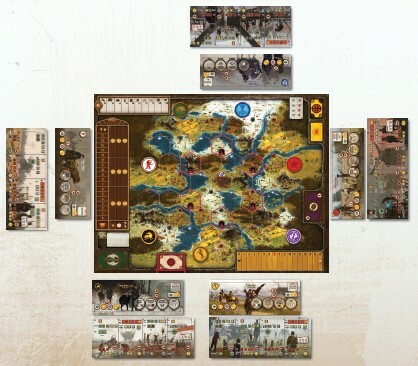 Each player should sit near the home base for their faction with their Faction Mat and Player Mat positioned in front of them; the seating order should be Nordic, Rusviet, Crimea, Saxony, Polania (Clockwise from top). Both the Faction Mat and Player Mat indicate your starting cards and track positions in the boxes on the far right of each mat. Place your character (miniature with the person & animal) on your faction's home base. Place 1 worker on each of the territories connected to your home base by land (a total of 2 workers). Your Player Mat is where you'll be choosing actions during the game. The player with the lowest number in the label on their Player Mat will go first. Play proceeds clockwise from there. Your Faction Mat is where you keep your mechs, stars, and coins. Each Faction Mat also shows a special ability in the upper right corner. We recommend that you don't try to teach every little rule to new players. Instead, give each player a quickstart card. This card contains key information about units on one side, and the other side covers broad concepts and gives players something specific to do for their first five turns. Your first game of Scythe isn't about devising a masterful plan or understanding every little rule. Just jump in and start pushing buttons to see how things work, referring to the rules when necessary. The riverwalk cards-one per player-are a reminder as to which factions have the ability to cross into each home territory if they unlock the Riverwalk mech ability, as each Riverwalk ability is slightly different. 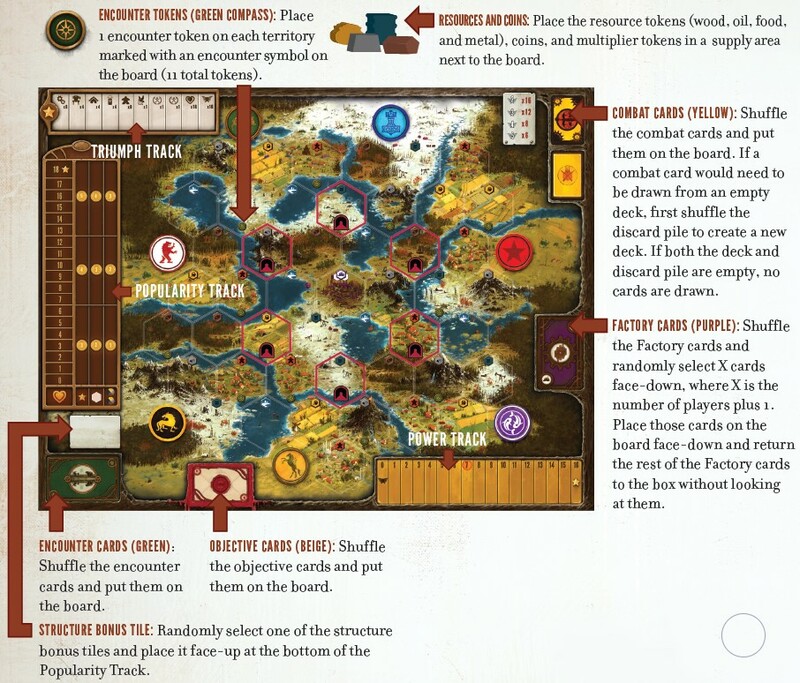 In Scythe, each player represents a character attempting to make their faction the richest and most powerful in Eastern Europa. Players explore and conquer territory, enlist new recruits, produce resources and workers, build structures, and deploy monstrous mechs. 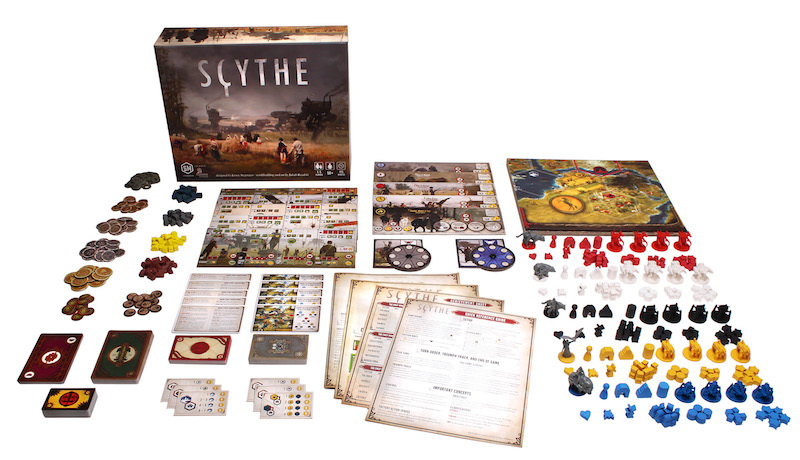 A game of Scythe typically begins with players building up their infrastructure, exploring the world, then engaging each other in combat. The amount of coins you earn depends on your level on the Popularity Track. The higher your popularity, the more coins you will earn. You can also get a few bonus coins based on where you built structures. 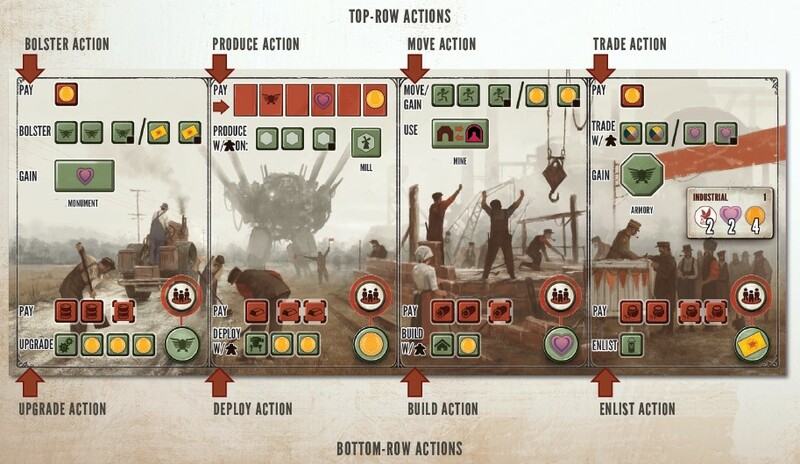 Scythe uses an ongoing action-selection mechanism (no rounds or phases). Players take turns one after another until a player places their 6th star on the board, immediately ending the game. Place your action token on a different section of your Player Mat than where it was on your previous turn. Take the top-row action on that section once (optional). Take the bottom-row action on that section once (optional). Thus, you may take a single action, both actions (from top to bottom), or neither action (but you must still move your action token). You may use resources gained from the toprow action to pay for the bottom-row action. Also, you may complete an objective card during your turn. The costs (red boxes) and benefits (green boxes) on your Player Mat are shown by the number of empty spaces before the action is taken. When taking an action, first pay the cost, then gain as much or as little of the benefit as you wish. You may only take an action once on your turn, not multiple times. After you've completed your turn (or as you're finalizing your decision on a bottom-row action-it is crucial for turns to overlap in this manner to keep the game moving at a steady pace), the next person in clockwise order takes their turn. The top-row actions appear in a different order on each Player Mat, though each action is identical. 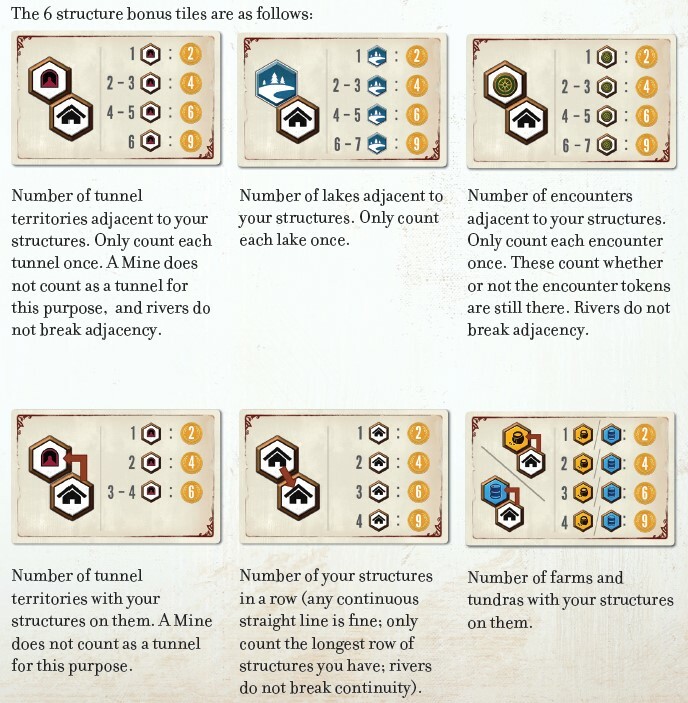 The Player Mat visuals and the default costs and benefits explained in this section are based on the starting position of each Player Mat. Do one of the following ("/" means "or"): Move: Move up to 2 different units you control (character, worker, or mech) from one territory (or home base) to one adjacent territory. Move one, then move the other. 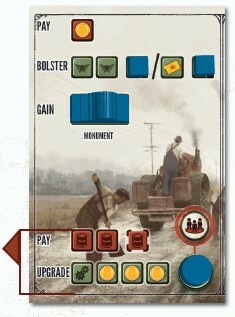 Resources and Workers: Units may pick up and drop off any number of resource tokens during a Move action. 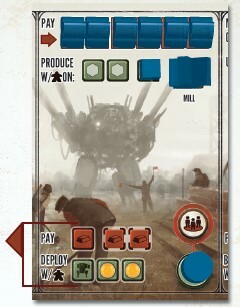 Mechs: In addition to resources, your mechs can pick up and drop off any number of your workers during a Move action. If they do, this does not count as movement for the workers, just the mech. So you could transport some workers on a mech, and then one of those workers could move on its own. You could also use part of your Move action to move a worker onto a territory with a mech, then move the mech while carrying the worker. Rivers and Lakes: By default, units may not move across rivers or onto lakes. This rule is broken by some mech abilities. River: A river is a body of water on the border between two land territories. Lake: A lake is a body of water comprised of an entire territory hex. It extends from the hex to any adjacent shoreline. Thus, in the example shown here, if a player has a special lake-movement ability, they could move from any of the surrounding territories onto the lake. Tunnels: For the purposes of the Move action for any unit, all territories with the tunnel icon are considered to be adjacent to each other. If your character or mech move into a territory controlled by an opponent's workers (and no other units), its movement ends (even if you have a mech ability that would allow it to move further). Each of the opponent's workers on that territory immediately retreats to their faction's home base, leaving behind any resource tokens. You lose 1 popularity for each of their workers you forced to retreat-they're not happy with you for forcing them off their land (in the case that you cannot reduce your popularity any further, the workers are still forced to retreat). Your workers cannot move by themselves into territories controlled by opponent workers. Any unit can move into a territory controlled only by a structure. The player who controls the unit now also controls the territory. If your character or mech move into a territory controlled by an opponent's character and/or mechs, its movement ends (even if you have a mech ability that would allow it to move further). The opponent still temporarily controls that territory. After you've completed all Move actions, if any of your mechs or your character share a territory with an opponent's character or mechs, combat happens. Your workers cannot move by themselves into or out of territories controlled by opponent characters and/ or mechs. Home Base: By default, you may not use the Move action to move any unit from the board into any home base (including yours). Encounters: If you move your character into a territory with an encounter token, their movement ends and they cannot move again this turn. After resolving all combats for this turn, if your character is still in such a territory, discard the encounter token and resolve the encounter. 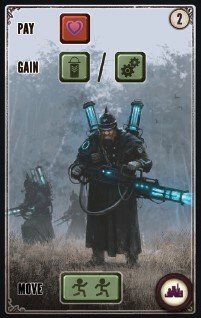 No Limit: There is no limit to the number of same-faction units that can be on a territory. Pay the cost ($1) and gain one of the following: Power: Increase your power by 2 on the Power Track. Power is the commodity you will spend in combat. Combat Card(s): Draw 1 combat card. Combat cards are used to augment the power you spend in combat (you may spend up to 1 combat card per character/mech in combat). If a combat card would need to be drawn from an empty deck, first shuffle the discard pile to create a new deck. If there is no discard pile, no cards are drawn. 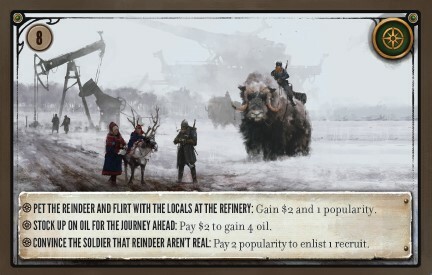 Pay the cost ($1) and gain one of the following: Resources: Gain any 2 resource tokens (any combination of oil, metal, food, and/or wood) and place them on any territory you control with at least one worker on it. You may not take the trade action to pay for resources if all of your workers are on your home base. Popularity: Increase your popularity by 1 on the Popularity Track. Popularity is a commodity used in Encounters, and it determines your scoring multiplier at the end of the game. Pay the cost (depending on what is shown on all exposed red rectangles before taking the Produce action), choose up to 2 different territories you control, and all workers on those territories may produce. 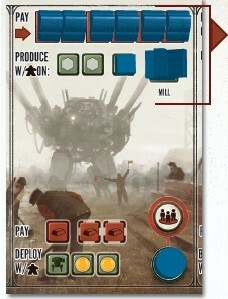 On the territories you selected for production, each worker may produce 1 token. The resource token is placed on the territory where it was produced. 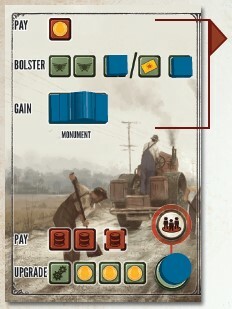 If a worker produces another worker (by producing on a village), after paying the Produce cost, pick up the leftmost worker of the Produce action on your Player Mat and place it on the village. Payment is required: As is the case with any action, you must be able to pay the full cost to take the Produce action. If you don't have the coins, popularity, and/or power, you must take other actions instead. No Limit: Any number of resource tokens or workers can be on a territory. There are no limits to the number of resource tokens in the game. If necessary, place a multiplier token next to resource tokens on the board. 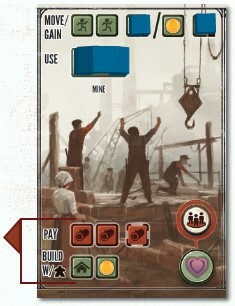 Workers are permanent: Once you have a worker on the board, you cannot return it to your Player Mat. The bottom-row actions are in the same order on all Player Mats, but the costs and benefits vary. The Player Mat visuals and the default costs and benefits explained in this section are based on the starting position of each Player Mat. Overlapping Turns: Usually when a player starts to take the bottom-row action (which isn't interactive but may take a few seconds to figure out), the next player can start to take their turn. Coins: Most of the bottom actions give you at least one coin when you pay to take that action. We recommend that players take the coins before implementing the main focus of the action so they don't forget to gain those coins. A player may choose not to take the coins (e.g., if coins interfere with their objective). Completing Actions: Eventually you may "complete" a bottomrow action (e.g., with the Upgrade action, at some point you may have nothing more to upgrade). After that point you may continue to pay the cost of the action to gain the coins (and the recruit bonus, if applicable). Recruits: Each of the bottom actions has a Recruit Ongoing Bonus (green circle). If it is exposed, it rewards a player when they or adjacent opponents take this action. Upgrading improves the efficiency of the infrastructure in your growing empire. The resource used to upgrade is oil. To upgrade, pay the cost, pick up a technology cube from any green box on your Player Mat, and place it on any empty red box with bracketed borders. Red boxes with solid black borders are off limits for upgrades. You can deploy mechs (miniatures) to protect your workers, expand your empire, and add new abilities to your character and other mechs. The resource used to deploy mechs is metal. To deploy a mech, pay the cost, choose any mech on your Faction Mat, and place that mech on a territory you control with at least one worker on it. You can't deploy mechs on lakes (even if your faction has mech abilities allowing your mechs to move onto lakes). From now on, your character and all mechs (not your workers) gain the ability on the Faction Mat that was under the mech miniature. These abilities vary from faction to faction. Riverwalk: Your character and mechs can move across rivers onto forests and mountains. Underpass: For the purposes of Move actions for your character and mechs, mountains you control and all tunnels are considered to be adjacent to each other. For example, if your mech is on a mountain, it can move from that mountain to a any other mountain you control or b any tunnel (or your Mine). Before you engage in combat on a territory with a tunnel or your Mine, the combating opponent loses 2 power. This loss of power is reflected on the Power Track. You may do this once per combat, not once per unit. Speed: Your character and mechs may move one additional territory per Move action. If any of those units move into a territory containing an opponent's character, mech, or worker, their movement ends and they cannot move again this turn. Moving from one tunnel to another still counts as 1 move, so with this ability you could move an additional territory before or after moving through a tunnel. Your mechs can pick up and drop off resources and workers in the middle of a Move action when they have the Speed ability. Riverwalk: Your character and mechs can move across rivers onto farms and villages. Township: For the purposes of Move actions for your character and mechs, villages you control and the Factory are considered to be adjacent to each other. For example, if your mech is on a village, it can move from that village to a any other village you control or b the Factory. 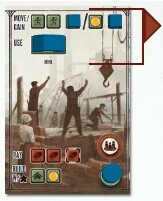 People's Army: In combat where you have at least 1 worker, you may play one additional combat card. You still require a character or mech to participate in combat. For example, if you have 2 mechs and 3 workers in combat, you may play up to 3 combat cards (1 for each of the mechs and 1 because you have at least 1 worker). Seaworthy: Your character and mechs can move to and from lakes and retreat onto adjacent lakes (you may still also retreat those units to your home base). This allows for lake hexes to be treated the same as other territories for movement. If a mech transports workers onto a lake (during a Move action or when retreating) or if a character or mech transports resources onto a lake, you may not leave those workers or resources on the lake after moving off of it, nor may a worker move off of the lake without the assistance of the mech. Lakes are territories, so if two factions have a lakemovement ability, it's possible for combat to happen on a lake. You cannot build a structure or deploy a mech on a lake. Artillery: Before you engage in combat, you may pay 1 power to force the combating opponent to lose 2 power. This loss of power is reflected on the Power Track. You may do this once per combat, not once per unit. Speed: Your character and mechs may move one additional territory per movement. Riverwalk: Your character and mechs can move across rivers onto farms and tundra. Wayfare: Your character and mechs may move from a territory or home base to any inactive faction's home base or your own regardless of the distance. An "inactive faction" is any faction not currently in the game, including the expansion factions. Normally players may not move into any home base, but this is an exception to that rule. Scout: Before you engage in combat, steal one of the opponent's combat cards at random and add it to your hand. You may do this once per combat, not once per unit. Riverwalk: Your character and mechs can move across rivers onto villages and mountains. Submerge: Your character and mechs may move to and from lakes and move from any lake to another (similar to tunnel movement, but with lakes). If a mech transports workers onto a lake or if a character or mech transports resources onto a lake, you may not leave those workers or resources on the lake after moving off of it, nor may a worker move off of the lake without the assistance of the mech. Lakes are territories, so if two factions have a lakemovement ability, it's possible for combat to happen on a lake. You cannot build a structure or deploy a mech on a lake. Camaraderie: You do not lose popularity when forcing an opponent's workers to retreat after winning combat as the aggressor. This applies any time on your turn when your character or mechs force an opponent's workers to retreat after combat. Speed: Your character and mechs may move one additional territory per movement. See page 15 for full details. You can build structures (structure tokens) to enhance your actions, control territories, and get end-game bonuses. The resource used to build structures is wood. 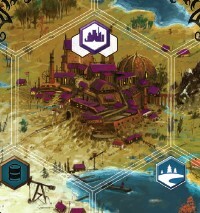 To build a structure, pay the cost, pick up any structure from your Player Mat, and place it on a territory you control with at least one worker on it. Limit 1 per territory: Only 1 structure can be built on each territory. So if you're the first player to build a structure on a specific territory, neither you nor any opponent may build another structure there. Structure Control: Opponents can't use your structure abilities. You always get the abilities from your structures even if you don't control the territories they're on (except for the Mill--you can't Produce on the Mill's territory if you don't control that territory). 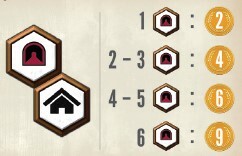 Territory Control: A territory with one of your structures on it is under your control even if you have no units there. However, if an opponent's unit is on a territory with your structure, that territory is under their control. Permanence: Structures cannot be destroyed or moved. Factory: You may build on the Factory territory. Places you can't build: Your home base isn't a territory, so you can't build there. You also can't build structures on lakes. Ongoing Bonus: The benefit revealed by removing a structure from your Player Mat is an additional benefit you will gain when taking the top-row action directly above it in the future. Monument: Whenever you take the Bolster action, also gain 1 popularity. Mill: Whenever you take the Produce action, the territory with the Mill may count as an extra (bonus) territory for production. The Mill will produce as if it were a worker. 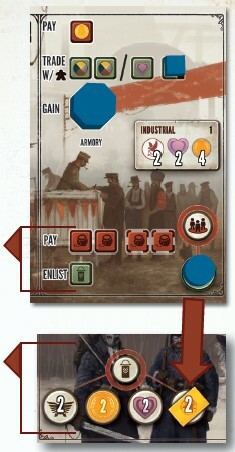 If there are actual workers on the Mill territory, they may also produce resources. Mine: The Mine acts as a tunnel that only you can use. You may move units to and from your Mine as if it is a tunnel (even if an opponent controls the territory the Mine is on). Unlike the other structures, this is an ongoing ability associated with all unit movement. Armory: Whenever you take the Trade action, also gain 1 power. End-Game Bonus: At the end of the game, players will gain coins for achieving the goals shown on the structure bonus tile that was randomly selected during setup. You gain this bonus even if you don't control the territories the structures are on. This bonus represents how property values have strengthened your expanding empire. You can enlist new recruits (cylindrical tokens) to join your forces. The resource used to enlist recruits is food. 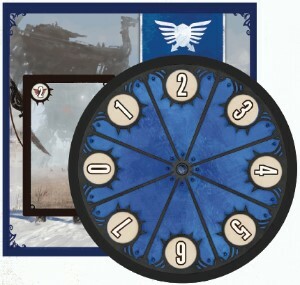 One-time Bonus: To enlist a recruit, pay the cost, pick up a recruit token from any section of your Player Mat, place it on any open Recruit One-Time Bonus space on your Faction Mat, and immediately gain the depicted bonus. This represents what your new recruit is immediately contributing to your forces. The token remains there permanently-it can't be moved. Ongoing Bonus: In addition to the one-time bonus, each recruit gives you a Recruit Ongoing Bonus related to the action from which you selected the recruit token (the bonus in the circle). This represents a skill the recruit brings to your force. For the rest of the game, whenever you or the player to your immediate left or right (these players are shown in the icon in the red circle) take the bottom-row action in the section of the Player Mat from which the recruit was taken, you may gain the specified bonus. Top-row actions or a similar action on a Factory card do not count. Player Order: If more than one player would gain a Recruit Ongoing Bonus, the active player goes first, followed by the player to their left, then the player on their right. If one of those players places their 6th star as a result, the game immediately ends. Proclamation: You must announce when you take bottomrow actions so adjacent players know to check for Recruit Ongoing Bonuses. Two-Player Rules: In a 2-player game,whenever your opponent takes an action that would give you a Recruit Ongoing Bonus, you only gain it once. Combat may happen at the end of a player's Move action (after all units have moved but before the player takes a bottom-row action). If that player's character and/or mechs share a territory with an opponent's character and/or mechs, combat occurs. It's possible for this to happen on multiple territories; in that case, the active player (the attacker) chooses the order in which these combats occur. Combat happens only between the two players whose units share a territory, either of whom can gain a star for winning the combat. Other players may try to influence the combating players by bribing them with coins. No Requirements: You may initiate combat even if you have 0 power and/or 0 popularity. Attacker Advantage: If the attacking player has a mech ability that impacts combat, they use that ability first, followed by the defending player. Also, if combat results in a tie, the attacking player wins. Simultaneously and secretly select a number on your Power Dial (align the number with the icon at the top right). That is the amount of power you will spend, so you cannot choose a number higher than the amount of power you currently have on the Power Track. The track goes up to 16 but you can only spend up to 7 power on your Power Dial. Add Combat Card(s) (Optional): By default, for each of your units involved in the current combat (character and/or mechs), you may tuck 1 combat card from your hand behind the Power Dial. You may do this even if you select 0 power on your Power Dial. 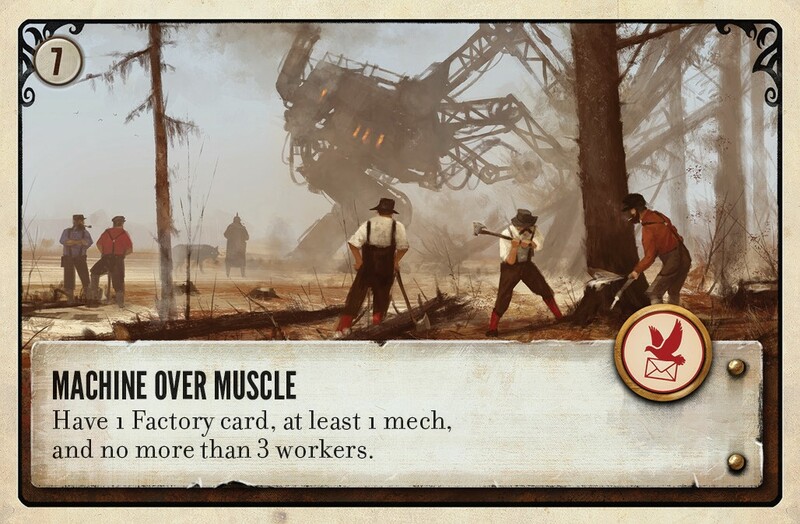 Designer's Note: You might be surprised by how few combats happen in a game of Scythe, especially given the universal presence of mechs in Jakub's art. However, if you look at all of the illustrations, you'll notice that very few of the mechs are actually fighting. In that way, Scythe is just as much about the threat of combat as it is actual combat. If your neighbor has built up a big pool of power and combat cards, you're less likely to attack them. Similarly, you might position workers on key territories to dissuade more aggressive players from attacking you there due to the loss of popularity if they win. 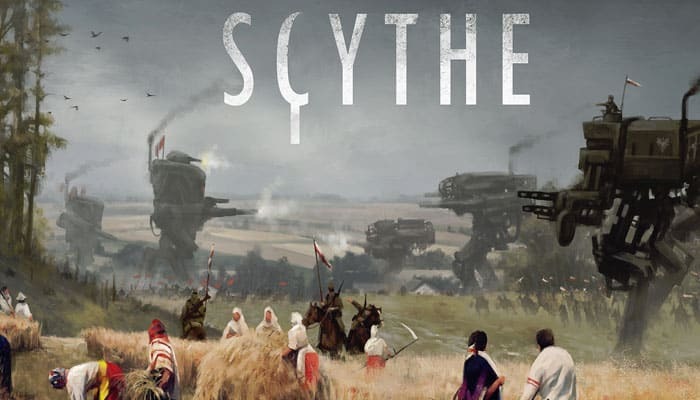 It is this tension that exemplifies the core theme of Scythe: the intersection of farming and war. Both players reveal their Power Dials and selected combat cards simultaneously. The value provided by any combat cards provides an additional bonus to the power you spend from the Power Track as indicated on your Power Dial. The player with the highest total power wins the combat (ties go to the attacking player). Both players then pay the amount of power they selected on their Power Dials, and they discard any combat cards they used face-up (you don't adjust the Power Track for combat cards-they're just a temporary boost). Winner: The winner gains (or maintains) control of the territory and all resource tokens on it. The winner also places 1 star token in the combat space of the Triumph Track if they haven't already placed 2 stars for combat victories. If the winner was the attacker, they lose 1 popularity for each worker they forced to retreat by initiating and winning combat. Also, if there was an encounter token on the territory and the winner has a character there, they now perform the encounter. Loser: The loser must retreat all of their units-mechs, characters, and workers-from the combat territory to their home base (pick up those units and put them down on their home base). All resources those units were carrying remain on the territory and are now under the control of the winner. If the loser revealed at least 1 power on the dial or through combat cards, they gain 1 combat card as they retreat. Limited Stars and Game End: Each player can gain a maximum of 2 stars for winning combat (with the exception of the Saxon player, who can gain unlimited combat victory stars), but they may still engage in future combats after they've achieved those 2 stars. If your 6th star is placed but you still have a combat remaining on your turn, the game ends and any units you moved to initiate that combat will move back to the territory from whence they came. Battle in a lake: Lake battles can happen between factions like Polania and Nordic that have activated lake-related mech abilities. If a mech transporting workers is attacked while on a lake and the attacker wins combat, the attacking player loses 1 popularity for each of those workers (they are forced to retreat with the mech to their home base). As your character treks across Eastern Europa, they will encounter a number of local people and situations. Each encounter will present you with three options to determine how you want to interact with the people. The choice you make will often impact the peoples' view of you, represented in the game by your popularity. When you move your character onto a territory with an encounter token on it, their movement ends and they cannot move again this turn. When your Move action is completely over and you've resolved all combats (but before you take a bottom-row action, if applicable), discard the encounter token and draw an encounter card. Only characters will trigger an encounter. Show the art to the other players and read the thematic text (the text in all caps) out loud. Then read through the various costs and benefits on the options and choose one (you must choose one and pay the cost if applicable, though you may gain as much of the benefit as you'd like). After you make your selection, discard the encounter card to the bottom of the encounter deck face-down. Required cost and optional benefit: If you don't have popularity or coins to pay for certain options, those options aren't available. You may gain as much of the benefit as you like (e.g., if a benefit would give you 2 metal and 1 worker but you don't want the worker, you can just gain the 2 metal). Benefit Location: Any resources, structures, mechs, or workers you gain from the encounter card go on the same territory as your character (i.e., where the encounter took place). Isolated cost and benefit: If an encounter card instructs you to gain something or perform an action, you do not pay any additional costs or gain additional benefits beyond those on the encounter card, nor do you trigger any Recruit Ongoing Bonuses. Combat: If a character moves onto a territory with an encounter token and an opponent's mech, thus initiating combat, the encounter only happens after the character wins combat. Otherwise the encounter token remains on the territory. Number: The number in the upper left corner is just for referencing the card for questions posted. Designer's Note: We made a specific design decision with the beautifully illustrated encounter cards: Rather than tell the players what they're seeing through a label or flavor text, we'll let you use your eyes to see the scene you've stumbled upon. There's often a lot happening in these scenes (it's usually not just one specific thing that's happening), and the three options explain the various ways in which you can act. Encounter cards are shown to all players when they're drawn, so your gaming group can integrate as much or as little of the story into the way they play Scythe as they like. We're giving you the same visual freedom you'd experience if you stumbled upon these scenes in real life rather than restricting you to the limitations of flavor text-after all, a picture is worth a thousand words. The Factory is the centerpiece of the Scythe board. It is a place of technological innovation and untapped power. Unlike most other territories, the Factory does not produce any resources. 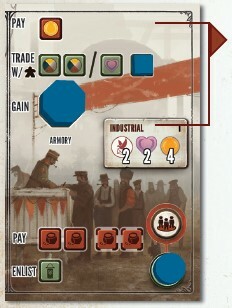 At the end of the game, the Factory is worth a total of 3 territories (instead of just 1) to the player who controls it. When your Move action is completely finished (after winning combat if necessary), if your character is on the Factory for the first time this game, look through the Factory cards on the board. You must choose one card and return the rest to the board. The first player to look at those cards will see cards equal to the number of players +1; each subsequent player to visit the Factory with their character will see one fewer card. It's good to get there first. Each Factory card is the equivalent of a fifth section of your Player Mat (place it next to your Player Mat). Using Factor Actions: The Factory card is treated as any other section on your Player Mat. 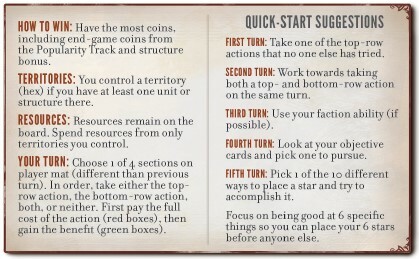 On your turn, you may place your action token on the Factory card and take one or both actions (starting with the top-row action if you choose to take both). 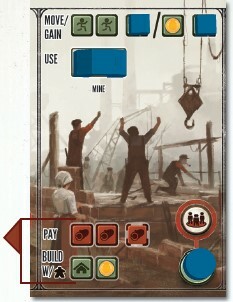 Separate from player mat bonuses: Even if the Factory card action does something similar to another action on your Player Mat, they're completely independent of one another. So you get neither Recruit Ongoing Bonuses, Structure bonuses, nor coins from similar actions on your Player Mat. Move: All Factory cards have a bottom-row Move action. It's a little different than a standard Move action, as it says, "Move one unit up to two times within the same Move action". Consistent with other rules: All other rules for movement still apply, especially those that say that the entire Move action ends if your character moves onto a territory with an encounter token or a character/mech moves onto a territory occupied by an opponent's unit(s). Mine: If you have a Mine, you may move through the Mine with this Move action. Speed: If you've unlocked the Speed mech ability, one of your mechs or your character may move up to 3 territories with this Move action. One-card Limit: You may have at most one Factory card (the one you choose the first time your character goes to the Factory). Permanent Selection: Your selection is permanent-you may not switch your Factory card for another card if your character ends a future Move action on the Factory. Each player starts the game with 2 objective cards that are kept secret from the other players. You may reveal a completed objective card during your own turn before or after you complete a top- or bottom-row action. If you do, place 1 star token on the objective space of the Triumph Track and discard the card along with your other objective to the bottom of the objective deck. You can only achieve 1 objective star, unless you're the Saxon player, who can achieve up to 2 objective stars. You may wait to reveal your completed objective if you wish, but you must meet the entire objective requirements at the time you reveal it. Designer's Note: It may seem a little odd that each player has 2 objective cards but may only complete one of them. There are a few reasons for this. The first is that the alternative would be to have each player draw 2 cards at the beginning of the game and keep 1. However, I prefer not to ask players to make decisions before the game begins, as it makes the game more welcoming to new players and gives experienced players more freedom depending on how the game starts to play out. The second is that it gives players the flexibility to change strategies mid-game. Maybe you were pursuing one strategy, but that strategy didn't end up working out. No problem-you still have another objective card to use. Players may make informal agreements (e.g., "I won't attack you this turn if you don't attack me next turn"). The only tangible items that may be exchanged are coins. In tournament play, coins may not be exchanged for deals or alliances. You can't negotiate your way out of a combat that has already begun-that is, if a player moves their character and/or mechs onto a territory you control with your character and/ or mechs, at the end of their Move action, the two of you must engage in combat (you can't pay them off at that point, though you could try to influence the outcome). Agreements made between players are not enforceable. When you reach a pinnacle of empire building, your faction rewards you with a star. Stars are worth coins at the end of the game. When you achieve one of these goals, you must place a star on the appropriate space on the Triumph Track. You cannot lose a star after you've placed it. For example, if you place a star for reaching 18 popularity and you later drop below 18, the star remains on the track. By default, each player may complete each of these goals exactly one time. Having a star on a goal does not prevent other players from placing their stars on the same goal. The game immediately ends when a player places their 6th star token, even if they have other things they could do that turn or other things would happen afterwards. If the 6th star comes from taking a bottom-row action, gain the primary benefit, the coins, and the Recruit Ongoing Benefit before placing the star. If you have units (character, mechs, or workers) remaining on a territory with an opponent's units (from a Move action), you must undo that portion of your Move action, returning the unit(s) to the territory they moved from. If you place a star for total popularity or total power as a recruit bonus on an opponent's turn, that placement happens after the opponent takes the action (e.g., build a structure) in clockwise order and only if that opponent didn't place their 6th star by taking that action. The first time you play Scythe, we recommend that you run a sample scoring round during the game so players have a feel for the actual end-game scoring in advance. After any player places their first star, pause the game to let players calculate their current score. This is just for the sake of example-this scoring does not actually happen until the end of the game. Accumulate your final fortune-coins you had before the game end was triggered plus end-game coins-to determine the winner. You should have a mound of coins in front of you before announcing the total to the other players. To determine how many coins you earn for each of the three scoring categories, look at your level on the Popularity Track and pick up coins for that category (do this on your own-there is no need for a "banker"). Designer's Note: Scythe incentivizes players to end the game if possible by making stars worth coins and denying additional turns to opponents. This may result in some opponents having one fewer overall turns than the player who placed their final star. Delay of Game: Because of the various end-game scoring categories and their connection to popularity, it's difficult for players to determine who is in the lead (this is intentional). However, it is possible for a player to interrupt the game to calculate the final score for each player as they plan out their next few moves. That's not fun for anyone. The Delay of Game variant says that if a player delays the game (while the game is being played, not during end-game scoring) for more than 10 seconds by trying to calculate the final score, they lose 2 popularity. Coins in Hand: The coins you accumulated during the game count for end-game scoring. Every Star Token Placed: Gain coins for every star token you placed during the game. Every Territory Controlled: Gain coins for every territory you control (including lakes). Home bases aren't territories. You control each territory where you have a worker, mech, or character, or where you have a structure (but no enemy units). 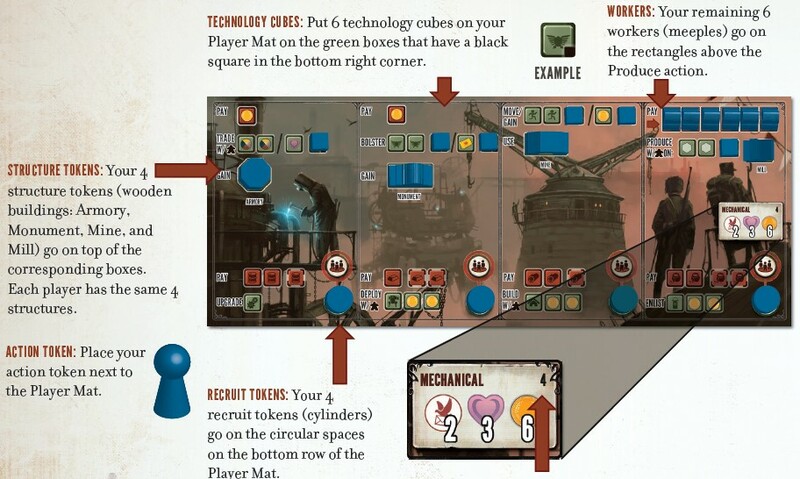 Factory: At the end of the game, the Factory is counted as 3 territories to the player who controls it. Every 2 Resources Controlled: Gain coins for every 2 resource tokens you control (e.g., if you control 13 resource tokens and have 10 popularity, you'll gain a total of 12 coins). Workers are not resources. You control all resources on territories where you have a character, worker, mech, or a structure not occupied by an opponent's unit. Structure Bonus Tile: Gain coins based on the number of structure bonuses you achieved. You gain this bonus even if you don't control the territories your structures are on. Achievement Sheet: The winner of the game may write their name up to 2 times on the achievement sheet to memorialize their victory. This document commemorates the first time any player wins under a certain condition (e.g., the first victory with a specific faction).